Final two episodes of season 3. One apart a Crystal Skull with no fridge nukings or ego-maniac actors and the other about killer metal nits. We start with the team conduction remote exploration of an off-world Mayan-like Pyramid, which at over 1000m high is the largest structure they’ve ever found. During the search with the MALP Daniel notices an object off into the distance, a crystal skull similar to the one his grandfather found years ago, which he claimed allowed him to talk to giant aliens. During the briefing Hammond gives permission for a mission to the pyramid but the Skull room itself however is filled with an unusual form of radiation, with Fraiser requesting a limit to exposure inside. After arriving at the Pyramid the team quickly make their way to the Skull room. While the others get readings and look around Daniel is fascinated by the Skull, looking straight into its eyes, causing it to respond creating a large increase in radiation. Teal’c decides to Zat the now glowing, causing Daniel to get knocked down to the floor, but seemingly disappeared to the others, while Carter is rendered unconscious by the radiation, with O’Neill ordering an immediate evac, leaving Daniel seemingly trapped on the planet. While O’Neill and Carter are still recovering Teal’c is given permission to return again and recover the Skull for observation. Arriving back in the Skull room Daniel, now conscious, tries to get his attention but is unable to, with Teal’c running right through him. Teal’c and Daniel return successfully to the SGC, with no one else able to see him either and still presuming that Daniel was teleported somewhere by the Skull. With little other choice Daniel ends up observing those on base when they think no one else is around, such as O’Neill trying to escape the infirmary, Dr Rothman and Sylar failing to understand the Skull, Teal’c doing his kelno’reem meditation, and Hammond talking to his grandkids. With little progress at the base and the planet still off-limits due to the radiation the team decide instead to pursue the avenue of talking to Daniel’s grandfather Nick, who is currently in a psychiatric facility due to his claims of aliens. At the facility the team pose as friends of Nick’s to try and get information about the Skull in Belize, with Daniel asking Nick to tell them everything despite being unable to talk to anyone. Once the team meet Nick he starts berating Daniel for throwing away his academic career by his beliefs about the Giza pyramids involving aliens, believing that he made the same mistakes he himself did over the Skull. While trying to get Nick to open up they reveal they found another Skull (but obviously not its origins) but Nick refuses to talk further without being shown the Skull they found. Returning to the SGC O’Neill meets with Hammond to obtain permission to bring Nick in, managing to get it despite Hammond’s concerns regarding security. Once on the base Nick confirms that the Skull is identical to the one he found and that the one he found briefly teleported him to the Pyramid where they found the Skull and that giant aliens rose up from the chasm in the room before finding himself back in Belize, with Nick’s description hinting that his psychosis was due to the shame he felt at no one believing his stories. Daniel decides to spend time talking to Nick only for Nick to reveal that he can see Daniel, only thinking him a hallucination due to his illness. Daniel, having convinced Nick that he’s real, has Nick act as an intermediary to talk to the others on his behalf to request going back to the planet to fix what happened, proving his story by talking about Hammond being able to go to his granddaughter’s school play if he authorises the mission. Nick however manages to go on the mission as well by claiming Daniel said he needs to go too with Daniel unable to stop him. 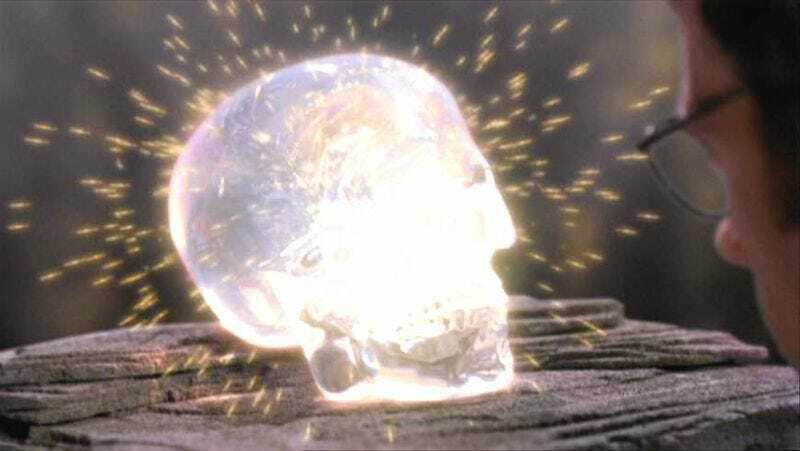 Adventuring back to the Pyramid Skull room one last time the team return the Skull to the pedestal, with Daniel looking into the Skull once more and activating it, this time rendering all the human members of the team ‘out of phase’ as well while Teal’c is left alone. While Teal’c is ordered back to the SGC the giant alien reveals itself to the others and unlike last time when Nick was teleported they are able to negotiate an exchange in efforts to defeat the Goa’uld, with Nick choosing to remain with the aliens to act as an emissary for the SGC. Crystal Skull is a fairly small scale episode compared to what’s to come, with the mainstay being a quick look at a number of the characters on the show but mainly focusing on who inspired Daniel to get into the field of archaeology in the first place. I do enjoy how the exploration and characterisation uses Daniel’s situation in a way that doesn’t cause them to break character while doing it, in particular the scene with Hammond keeping up the appearance required as a commanding officer while then transitioning to caring grandfather when he believes no one else is around is believable while if they had him doing it knowing he was being watched would seem odd given what we know of the character. The only real weakness of the episode was its heavy use of a CGI backdrop for the pyramid as it’s really noticeable when placed with the footage of the actors, with the scenes of them running looking like they’re running on the spot instead of moving. Overall Crystal Skull seems to have been a cheaper episode used to fill up the episode order but thankfully they haven’t cut corners in many areas, with a nice script that focuses more on character than others and has a number of memorable line and scenes. · I get that the aliens are giant and therefore cool but they’re made of pure smoke. What exactly are they meant to be able to do? The episode begins in the infirmary of all places with O’Neill looking for people to spend time fishing with, finding Daniel stuck in bed after having his appendix removed and Carter busy working on her Naquadah reactor prototype, before being beamed away to Thor’s ship which is in orbit. Looking around the seemingly abandoned ship he finds the ship is in fact infested by small bug-like robots that appear completely uninterested in him while the voice of Thor comes over the intercom, directing O’Neill to his location. The Asgard himself is on the verge of death due to injury, only having been able to device a series of recordings on why he’s there and how to use the ship. It turns out the ‘enemy worse than the Goa’uld’ are the machines O’Neill saw, called Replicators, who are attracted to advanced technology and have overrun the ship. The SGC, originally in a panic over O’Neill’s sudden disappearance, is contacted by O’Neill via hologram to ask for supplies he can use to take care of the ship and the Replicators but refuses to beam up the other members of SG-1 as it’s a one-way trip due to there being no way off the ship. O’Neill activates the beam up for the requested gear only to find that the SGC has overruled him and sent Teal’c and Carter along with the gear but they’re only able to grab some of the gear before the Replicators show up, this time however some of them follow the team. Attempting to deal with them the team find that Zats are completely ineffective and while Tau’ri weapons, such as shotguns, destroy the creatures they’re able to rebuild themselves almost immediately. Returning to Thor’s chamber the team get to work on putting together a plan to destroy the Replicator threat while Thor informs them how they found the Replicators and that the Asgard’s reliance on technology is slowly causing them to lose the war as the Replicators are easily able to learn and adapt to their tactics and weapons. The team decide to crash the ship into the Earth’s atmosphere before detonating a bomb, causing the ship to burn up in the process as the Replicators will be unable to survived atmospheric re-entry, which means they’ll need to retake control of the ship controls taken over by the Replicators when they took the ship. Teal’c and O’Neill head to the core to try and gain control but find that the Replicators have set up base there, numbering in the thousands. With their first plan failed they instead try to destroy an engine on the hull, which is used for landings, directly with Teal’c performing an EVA to plant the explosives. While this is successful unbeknownst to them melting material from the ship had leaked onto his suit, causing it to rupture as he tries to return to the airlock, leaving Teal’c stranded in space, while the Replicators themselves take over the airlock. Carter however manages to save him by beaming him back inside the ship moments before his lifesupport fails. With the plan in place the ship begins to descend into the atmosphere and the team awaiting their fate. Carter however comes up with an escape plan involving the beaming of the SGC’s Stargate to the ship and then manually dialling a way off the ship with Thor in tow. While the beam in is successful the Replicators are drawn to the beam site once again, forcing the team to defend the Gate and hold the Replicators off until just before the ship enters the atmosphere. The team manage to barely hold off the swarm before detonating the bomb but it’s not clear if they made it off the ship before it fell apart, with the wreckage crashing off the pacific coast. However at least one of the Replicators has managed to survive. So there we have it, the introduction of the long hinted ‘worse enemy’ who the Asgard have been fighting for many years and Earth once again at peril from them. The Replicators bring about the ability for the show to now have two major themes in the show, one a fight against the crafty and manipulative Goa’uld and the other against the oncoming hordes of the Replicators. I do like how the show puts this difference right there on the screen, with not only distinct audio cues as the orchestral sound is replaced by a mechanical sounding beat but also by changing the visual style from straight up military uniform and submachine guns for T-shirts, shotguns, and eye protection. As for the Replicators themselves they are an interesting enemy for the show, built primarily around the fear of one building a machine whose order to self-replicate makes everything in its path a target. The Goa’uld so far have been defined as being only as powerful as what they have in troops and ships while technologically almost everything has been scavenged from other beings. The Replicators on the otherhand, while being of a similar scavenger nature, are built directly out of what they steal and therefore directly absorb that technology. They also function essentially as a localised hive-mind that quickly adapts to enemy tactics and weapons, meaning that a race’s technology itself becomes a weakness in the longrun as the Replicators absorb it and are also drawn to it. They also have the ability to rebuild themselves but that isn’t seen ever again after the first scene in which it occurs. Overall the episode is a great first introduction to the Replicators that quickly fleshes them out as to what they are and what they do to build them as a threat while continuing the trend of ending the season with the Earth/team in significant peril. · Thor has no time to explain but somehow time to record a bunch of videos for O’Neill and then suddenly recovers when Carter arrives. Maybe Thor secretly hates O’Neill. · Why don’t they just detonate the bomb on the other side of the wormhole given how radio signals can pass through an active wormhole?